Caritas University, Amorji Nike Enugu, Post-UTME and Direct Entry Admission Screening Form, Requirements, Cut-Off Mark, Application Guidelines for 2018/2019 Academic Session. Applications are invited from suitably qualified and interested candidates for admission into the Caritas University, Amorji Nike Enugu, first Degree programmes for the 2018/2019 academic session. 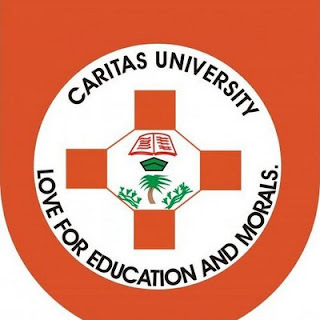 The vision of Caritas University is to rescue our wandering youthful population from further slide into academic and moral decay, and to develop and transform our society through sound and unadulterated education. Its mission's to discover and apply the knowledge of Science and Engineering for human well-being and sound development of man for better society. The University currently has four faculties: Engineering, Environmental Sciences, Management and Social Sciences, and Natural Sciences. SEE ALSO: Caritas University Pre-Degree Admission Form 2018/2019. The cut-off mark for admissions into Caritas University, Amorji Nike Enugu, for 2018/2019 academic session is 140 for all programmes. There will be no written Post-UTME Screening Test. Candidates who scored 140 or more in the 2018 UTME examinations, and have the requisite O’Level results (from WAEC, NECO or NABTEB) are invited for admission. Caritas University. Admission exercise is open until January 31 2019. FOR FURTHER INFORMATION CONTACT: THE REGISTRAR, CARITAS UNIVERSITY, ENUGU, P.M.B 01784. ENUGU.